Aboudia Abdoulaye Diarrassouba, ‘Le Couloir de la Mort’, 2011, Acrylic and mixed media on canvas. Image courtesy Saatchi Gallery. This text is published in Art South Africa Magazine (Volume 12, Issue 4: June 2014). The exhibition Pangaea: New Art From Africa and Latin America is at the Saatchi Gallery, Duke of York’s HQ, King’s Road, London SW3 4RY (2 April – 31 August 2014). What is at stake in this conflation (this apolitical imagining) which side-steps questions of the post-colony, and the relationships between politics and art markets? Exhibitions in London (about New Art from Africa and Latin America) run the risk of making a number of assumptions. Especially when staged as breaking new ground, advancing into the hinterlands of art worlds still to be recognised and consecrated by an imagined monolithic west. Pangaea, according to the catalogue introduction written by Gabriela Salgado, ‘takes its name from the pre-human landmass uniting Africa and Latin America’. The show ‘reunites the two former sister continents in an exhibition celebrating the parallels between their distinctly diverse cultures and creative practices, as they begin to receive recognition in the wider art world’. Despite the invocation of ‘sister continents’ there is not one woman artist represented on the show. The sixteen artists, interesting as they are, are all men. The idea that ‘this wider art world’ is located singularly in Europe and North America is nonsensical today. There are traces of a peculiar geographical narcissism which renders invisible the critical work of innumerable artists, curators, scholars and critics working across the globe from the twentieth century to the present. Okwui Enwezor deserves mention particularly as his curatorial projects, and associated collaborations and publications, engage the question of geography. Exhibitions such as these require more thoughtful staging. It is not clear, despite the catalogue text (which is contradictory) why the historically and culturally heterogeneous continents of Africa and South America are subsumed into this idea of Pangaea. What is at stake in this conflation (this apolitical imagining) which side-steps questions of the post-colony, and the relationships between politics and art markets? There is, nonetheless, a lot of engaging work to see on the island of Pangaea ranging from a younger generation of artists such as Aboudia Abdoulaye Diarrassouba (also known as Aboudia; b.1983, Abidjan, Ivory Coast) to David Koloane (b.1938, Alexandra, Johannesburg). But the decision to include Koloane (the only artist of his generation) is not clear, making for uneven curating. On show are photographs by Mário Macilau (b. 1984, Maputo, Mozambique) who similarly to Aboudia engages the political: both artists, of a similar age, emerge out of conditions of civil war. I enjoyed individual rooms curated around a single artist’s practice: those focused on Aboudia and Oscar Murillo (b.1986, Columbia) are especially strong as are the installations by Rafael Gómezbarros (b.1972, Santa Marta, Columbia) and Ibrahim Mahama (Tamale, Ghana, 1987). The oversized ant-bodies of Gómezbarros’s Casa Tomada, ordinarily appearing as site specific installations on public buildings, are eerily ambiguous: a dense cluster of bandaged forms cast from human skulls; a visceral comment on violence and vulnerability. Aboudia’s series Enfant dans la Rue opens up cultural archives and the historical objectification of Africa: torn fragments of Tintin comic strips and anthropological texts appear through the artist’s characteristic application of paint on a surface: textured layering, drips, swirls and chalk-like strokes. Works exhibited also exist in relation to a London-centric art market: painters such as Aboudia, Boris Nzebo (b. 1979, Port-Gentil, Gabon) and Vincent Michea (b.1963, Figeac, France) appeared on the inaugural 1:54 Contemporary African Art Fair in 2013. Michea is, in fact, French but lives and works between Dakar and Paris (further complicating the idea of geography, landmasses and borders). The idea of collecting moving image and performance is still largely an anomaly: neither is represented on Pangaea. The prehistoric significance of Pangaea begins to take on other kinds of meanings in the staging of this show. It is, quite frankly, bizarre that the formidable presence of women artists should be erased in a twenty-first century exhibition curated via the lens of geography. If only one could focus on the work of the artists without having to machete through the curatorial theatre of an imagined landmass without women. 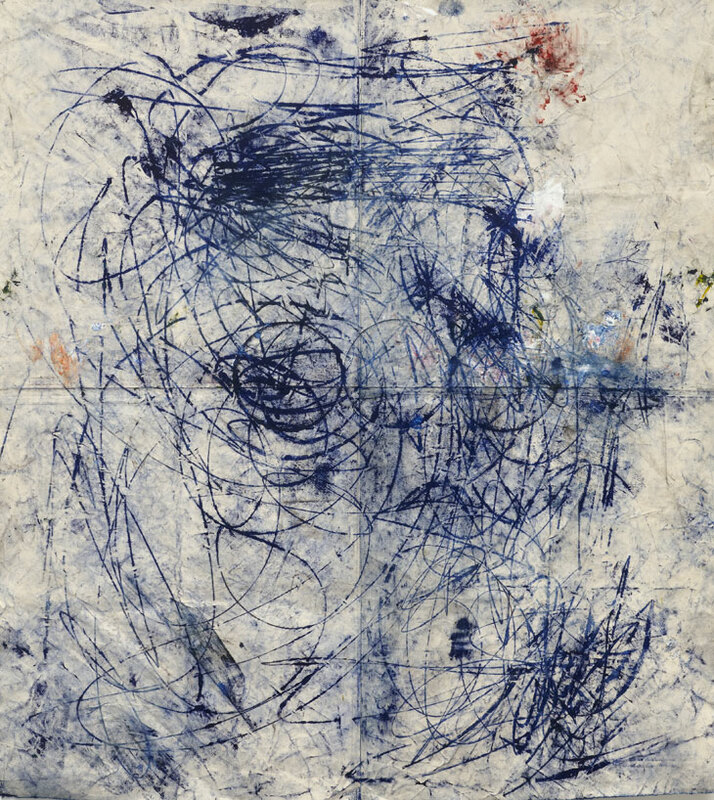 Oscar Murillo, Untitled, 2011, oil, oil stick, graphite, dirt on canavas. Courtesy Saatchi Gallery. Warder, R (ed.) Pangaea: New art from Africa and Latin America [exhibition catalogue] with an introduction by Gabriela Salgado. London: Saatch Gallery, 2014. This entry was posted in Review and tagged Aboudia Abdoulaye Diarrassouba, David Koloane, Geography, History, Ibrahim Mahama, Installation, Okwui Enwezor, Painting, Photography, Politics, Post-colonial, The Idea of Africa, women and history. Bookmark the permalink. Reblogged this on Ed Cross Fine Art.